Picture this: a get-away car, a driver, and a passenger with two cookbooks in tow. Is this you headed on a grand summer adventure? Maybe. I hope you will be excited for a spate of book reviews I’ve got coming up. Think of it as a Summer Required Reading List of sorts that will be several parts cookery and several parts poetry with a dash of memoir stirred into our class-is-out cocktail. Sometimes on road trips, I am the passenger, and I’ve always had a proclivity for reading in the car. Our first book of summer came all dolled up in muscovado and turbinado from Shauna Sever. Today, I want to bring to you hard crack. 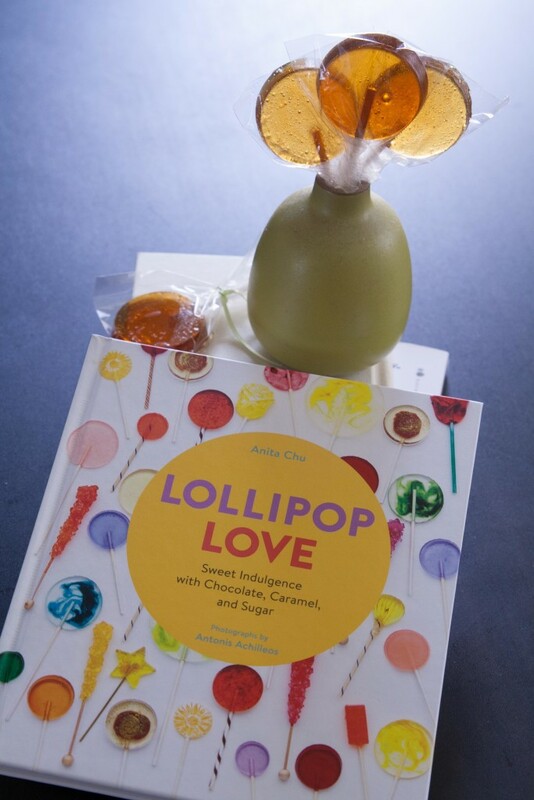 Another way of saying that is here comes a sweet surprise in Lollipop Love by Anita Chu. Do candy-makers have a special sense of humor? I hope so. It’s no mistake that I took Real Sweet and Lollipop Love on that 48 hour road trip. Several years ago, Anita, Shauna, Irvin Lin, and I all organized a food blogger bake sale for No Kid Hungry. For two fun years, the four of us banded like the Three Amigos (although, maybe that makes one of us D’Artagnan and the analogy is better suited to Musketeers?). Each of us figured out how we would contribute and it worked brilliantly, especially with the phenomenal addition of eager, passionate food blogger volunteers who baked and decorated some tempting treats. We had Celia to thank for letting us set up our pop-up bake shop outside of Omnivore Books and years later, we remain friends. At one of those bake sales, I first schemed to make a granola with green tea and liked it so much that it got tucked into the pages of my cooking with tea book. Back then, the aspiration of writing a cookbook had not happened for me yet and so I saluted Anita and Shauna as they took to their kitchens publishing several books (Anita: Field Guide to Cookies and Field Guide to Candy) and (Shauna: Marshmallow Madness and Pure Vanilla). Call it fate, call it kismet, call it a lot of hard work and sinkfuls of dirty dishes or packed refrigerators with trials 1 through 8, but all of us are cookbook authors now with Irvin’s first book, Marbled, Swirled and Layered is coming out Spring 2016. Imagine, then, my delight that my first book’s launch date happened to coincide mere weeks from Shauna’s and Anita’s. If life is sweet, it’s because of the company we keep. This brings us to lollipops. Lollipop Love is a slender, small book of 96 pages. As a novice candy-maker, I appreciated that the basic sugar lollipop recipe accompanies the reader onto almost every page. A good book instructs and inspires opportunities for departure. While the basics of lollipop making remain largely the same, some flavor combinations exist that excite and make me want to pull out my heavy-bottomed saucepan and get busy boiling. I’m drawn to flavors like the mango-chili lollipops (page 49) and the pink hued rosewater-saffron lollipops (page 35). If those sound a bit exotic, she also includes recipes for boozy lollipops like the Beer Lollipops (page 44) and what would be a knock-out for New Year’s Eve, Champagne and Glitter Lollipops (page 42). The book is divided into three sections, not counting the technique primer at the beginning. I like that she masterfully educates for any skill level and shows the process to make a batch of lollipops simply. Section one explores sugar lollipops and denotes the flavors mentioned above. If you tend to be sweet on caramel, section two is for you. I’ve been eyeing the Passion Fruit-Caramel Lollipops (page 67) or the Almond Butter Crunch Lollipops (page 73). Section three focuses on chocolate lollipops and has me thinking ahead to a fun form of evening entertainment. Who wouldn’t want to dip peanut butter lollipops into chocolate (page 90) as a do-it-yourself dessert? You will need a few essential supplies to get started, namely, lollipop sticks, lollipop molds, and a candy thermometer. And, here’s a genius tip from the Kitchn on quick and easy clean-up. Once you’ve set up your candy-making station, in less than 30 minutes you will have freshly brewed lollipops. I say brewed because, of course, I knew I needed to make her Peach Tea Lollipops (page 33). 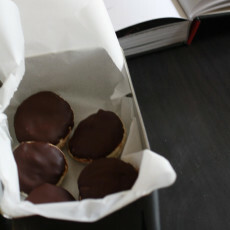 In the headnote, she recommends that you can use any tea, so I opted to use Earl Grey instead to give a bouquet full of bergamot scented suckers to a friend for her birthday. 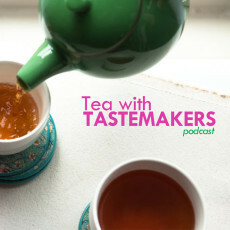 One thing she notes is that when brewing the tea you want more astringency from it, so plan on brewing black tea for around 6 to 8 minutes . Switch it out and brew your favorite green tea, or concoct Honey-Chamomile Lollipops (page 45) for an herbal infused throat soothing hard candy. There’s a lot to love about lollipops. adapted ever so slightly from Anita Chu’s “Peach Tea Lollipops” from Lollipop Love. 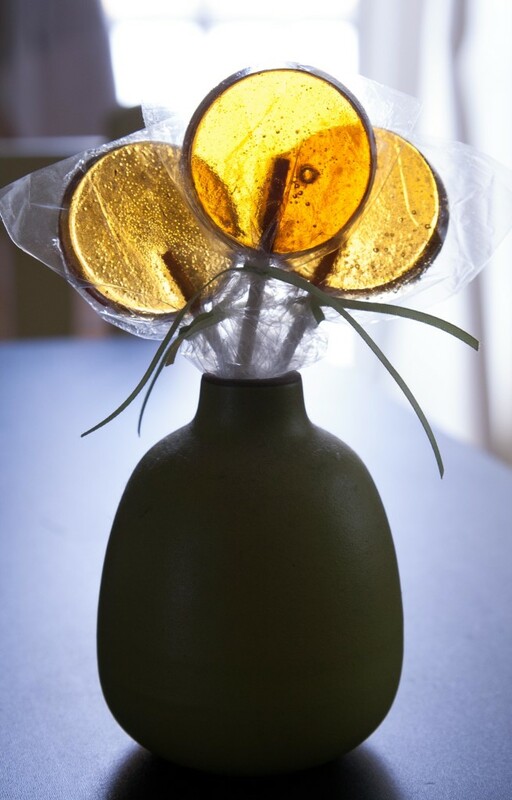 Store the lollipops in cellophane bags, tied off tightly and in a cool, dry place where they can be kept for 1 month. The recipe calls for light corn syrup, which isn’t high fructose corn syrup, but the kind used to make pecan pie. 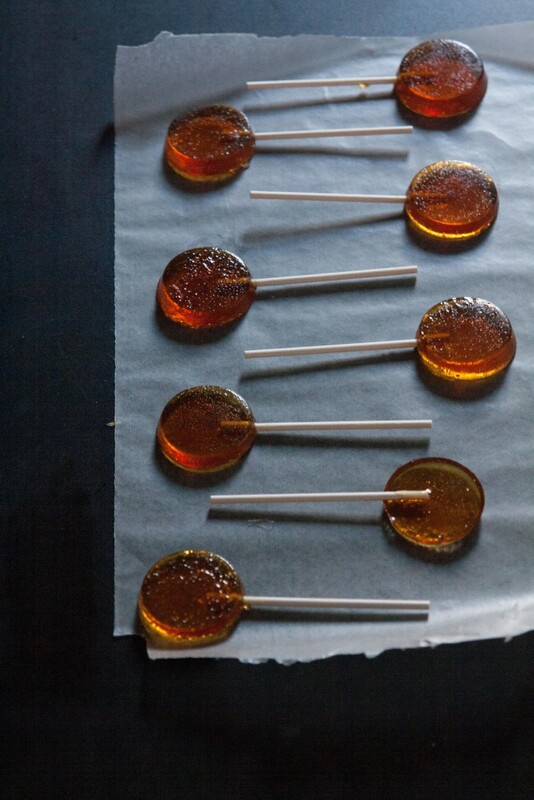 If you’re not keen on corn syrup, try her recipe for Sweet Agave Lollipops on page 52 instead. Coat the lollipop molds lightly with nonstick cooking spray. Place lollipop sticks in the molds. Combine the sugar, tea, and corn syrup in a large, heavy saucepan. Bring to a boil over medium-high heat. Continue cooking until the mixture reaches 300F/149C (hard-crack stage). Immediately remove the saucepan from the heat. Pour the mixture into a heatproof measuring container with a spout, or a candy funnel. Divide the mixture among the prepared molds. Let the lollipops cool and harden, about 15 minutes, before removing them from the molds. 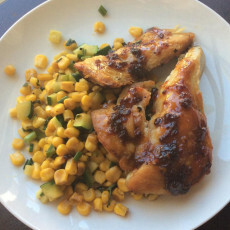 Hey, I tried your recipe and it didn’t work! The syrup doesn’t get thick even after much boiling. I think the water level is too high.